Sirin is a female grey Eastern Screech Owl. 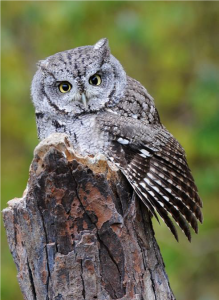 Like Great Horned Owls, they have ear tufts and golden eyes. Sirin was admitted on May 6, 2018 from Martinville, OH as an orphaned nestling. She was found in a flower bed next to a house. Unfortunately Sirin could not be released because she has cataracts in both eyes. She has no vision in her right eye, and diminished vision in her left eye. Even with this disability, she is able to navigate her enclosure with surprising skill.